Vada's Blog Stamp Inks and Paper : Stampsmith Challenge #19 is “Teal and Yellow” Any stamp. Stampsmith Challenge #19 is “Teal and Yellow” Any stamp. 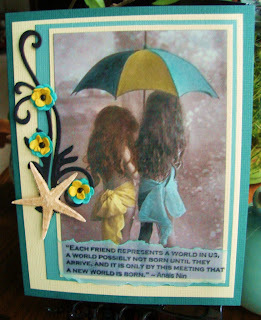 Today I’m playing along with Lynne and ladies at Stampsmith on their color challenge of “Teal and Yellow”. I don’t know whose graphic this is, so if anyone does know, please e-mail me so I can give that person proper credit… Love these little girls and I have used them many times. The graphic is black and white, so I chalked in some color. My stamp is from The Stampsmith. I hope you will join us and play along with this color challenge. Vada, I can see why you would use that image! These little darlings are so cute in their little teal and yellow outfits. Beautiful coloring! Love the flourish and shell! Stay cool! Oh so darling! Love the colors, too, Vada! Vada, your work is just beautiful! Love it! Terry WELCOME to TSC!!! I am thrilled that you are participating. Oh this is so beautiful, the image teamed up with The Stampsmith quote, which is a lovely quote, isn't it. You made use of the colours so beautifully. A fabulous image so beautifully coloured a perfect balance, I love it. Love how you colored the image with chalks! Beautiful project. 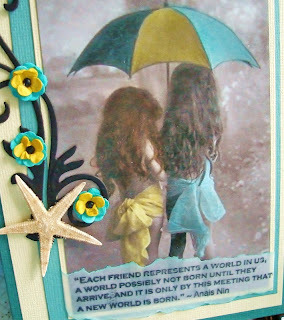 Love the teal and yellow umbrella. Thanks so much for joining us at the Stampsmith Challenge. This is so beautiful... love your chalking in the challenge colors and those darling little flowers. Lovely! Beautiful card! I would love to have that image.